The European Union's (EU) decision to extend import duties on Chinese-made bicycles and parts till 2016 may virtually keep Chinese bicycle makers, who are largely dependant on exports for profit growth, out of the European market. Terming the EU decision as nothing short of trade protectionism, Chinese companies say such actions are "unfair trade practices that are bound to give European companies an undue advantage". Much of the anger also stems from the fact that Europe is one of the biggest bicycle markets in the world with sales of bicycles and parts estimated at around 5 billion euros a year. The average demand for bicycles in the EU is around 30 million units a year, making it too big a market for companies to ignore. "I don't understand why the EU is extending the duties for another five years. In 2005 when we were expecting the duties to be scraped, the EU extended and raised the duty rate to 48.5 percent," says Yu Yaofeng, general manager of Shanghai Phoenix Import & Export Co Ltd, a leading Chinese bicycle maker. Despite being one of the eight big bicycle makers in China, Phoenix hardly has any exports to Europe due to the stiff duties, Yu says. Wang Chuanjun, manager of the overseas department at Tianjin Kelin Bicycle Co Ltd, a leading bicycle exporter from Tianjin, says export orders have been declining due to the higher duties. That the Chinese companies were aware of the hostility towards them in Europe was more than evident when only four companies turned up to espouse the cause of Chinese bicycle makers at the sunset review conducted by the EU on the issue in July last year. "Many companies used to actively cooperate with the EU during the anti-dumping investigations, but after spending a lot of money and time, they gained no positive answer. The EU is refusing to grant market economy status and that too without any reason," Zhang says. Tianjin Golden Wheel Bicycle (Group) Co Ltd, a private company, had represented Chinese bicycle makers at the European Commission hearing held in Brussels last year. Despite operating under a market-driven environment, the company has not got the market economy status, says a Xinhua News Agency report quoting Li Zhenkun, manager of the international trade department at Golden Wheel. "We do not take any government subsidy and we are completely market-oriented. I don't think EU's ruling is reasonable," says Wang Ruidong, president of Tianjin Kelin Bicycle. The EU has levied duties on Chinese-made bicycles from 1993 onwards after receiving dumping complaints from the European Bicycle Manufacturers Association (EMBA), which represents an industry that employs around 20,000 people, mostly in Germany and Italy. In 2000 and 2005, the EU extended the duty for a further five years twice and raised the duty rate from 30.6 percent to 48.5 percent in 2005. In July this year, the European Commission proposed to extent the duties for another three years after its third sunset review. But the European companies pressed for a five-year extension. "The EC's decision to extend duties for another five years is totally unwarranted," says Zhang. According to the regulations of the World Trade Organization, if a country considers imposing anti-dumping duty on imported products, it has to be proven that the dumping is causing material injuries to the domestic industry. And that is where the situation becomes murkier, say Chinese companies. 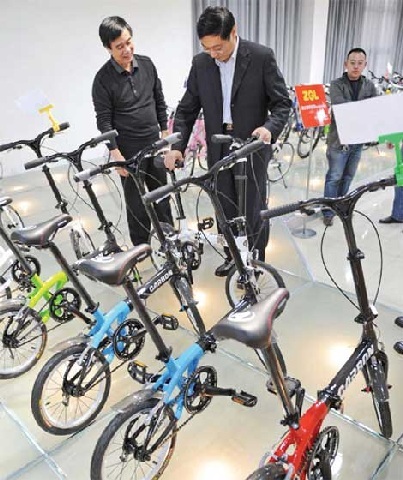 Bicycle export to the EU from China had decreased by 38 percent during the three year review investigation period, while the average product prices went up by a whopping 125 percent from 2007 onwards, says Zhang. In number terms, shipments of Chinese bicycles to the EU have fallen from 3 million units in the 1990s to around 600,000 to 700,000 units. In the same period, the EU bicycle industry has neither prospered nor shown any major declines, clearly indicating that there has been no real impact, he says. "What has really happened is that the market share of Chinese-made bicycles has fallen to nearly 3 percent in Europe. The current EU action clearly defies the basic laws of market economy," Zhang says. Part of the reason why European companies are so jittery is the sizable market share enjoyed by Chinese bicycle makers in the US and Japan over a short span of time. European companies are also worried that if the antidumping duties on Chinese bicycle products are removed, they would stand to lose even more market share, Zhang says. He says that market share is something that should be decided by the market and Chinese companies should not be denied market access just because they are more competitive in manufacturing and production. As the world's largest bicycle manufacturer and exporter, China exported 46 million of the 80 million bicycles produced in 2009 to over 174 countries and earned nearly $2.14 billion (1.51 billion euros). However, in 2009, the number of Chinese exported bicycles just accounted for 2.4 percent of the EU market, or less than 720,000 bicycles, equaling to only 5 percent and 8.9 percent of Chinese bicycle exports to the US and Japan during the same period, says data from the Shanghai Bicycle Association. "The EU is too big a market for Chinese companies to ignore," says Yu. "Even though the duties have been in place for some time now, we have been making considerable product improvements and manufacturing practices to make further inroads into Europe. Besides, we also have a huge customer base in Europe," says Wang. In recent times Chinese companies have been the victims of several anti-dumping investigations in Europe. During the past 30 years, the EU has filed 140 cases against China. The EU on May 14 this year imposed anti-subsidy duties of 4 to 12 percent for five years on imports of coated fine paper from China. The products were also slapped with anti-dumping levies ranging from 8 to 35.1 percent. On April 1, the EU terminated its collection of anti-dumping duties on leather shoes imported from China, which had been in place for four years. The end came one year after China lodged a complaint against the EU at the WTO. The European Commission is set to introduce five-year, punitive import duties of up to 69.7 percent on the imports of Chinese bathroom, kitchen and paving tiles worth 275 million euros annually, which will take effect starting from mid-September. "The financial and debt crisis in Europe has resulted in imbalanced economic growth and surging unemployment. Trade protection measures will only help protect employment in traditional and declining industries," says Sun Yanhong, a researcher at the Institute of European Studies under the Chinese Academy of Social Sciences. However, the ultimate victims of the anti-dumping duties will be consumers in Europe, say trade sources. "Consumers in Europe perceive bicycles as household goods that make their life more convenient and green, especially at a time when the EU is advocating more environmental protection," says Liu Huijuan, director of CCCME's legal department. "With its current decision the EU market has virtually been shut for Chinese companies for more than 18 years in a row," Liu says. Average bicycle prices in the EU range from 100 euros in Europe's eastern states to 680 euros in the Netherlands, say reports from Reuters. The European rates are nearly 30 to 40 percent higher than those in the US market. "The anti-dumping duty has deprived European consumers the chance to possess low-priced but good-quality bicycles from China," says Zhang.